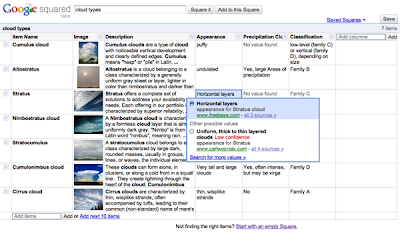 Yesterday Google announced Google Squared, a new release from Google Labs. From the official announcement: “Google Squared is an experimental search tool that collects facts from the web and presents them in an organized collection, similar to a spreadsheet.”. I’ve played with it for a while today, and while it might not be the best way to search for things, I can imagine a lot of great ways to use it in classrooms. The most obvious use is for teachers to use Google Squared sheets as learning materials. You can easily create a list of US presidents, african countries, renaissance artists, cats breeds, learning management systems, … and much more. Textbooks are all full of lists, but they are static. With Squared, you can create your own list, edit rows, columns and data, and easily change the whole list whenever you want to. Do you see Google Squared being useful in classrooms?